Runaway league leaders Saints were on the road to Widnes for their round nine fixture as they looked to further extend their points lead. But Dennis Betts side had different ideas, hoping that the derby against Wigan would have drained their opposition, and that they could capitalise. 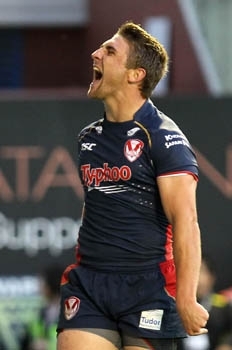 The home side saw Betts make a number of changes with Rhys Hanbury, Krisnan Inu, Ed Champberlain, and Joe Mellor all missing from the side which lost to Warrington on Good Friday. Theo Fages was back for Saints, replacing Jonny Lomax, while Matty Smith had a place on the bench for Justin Holbrook’s side. Conditions were awful, which side would cope best. Saints opened the scoring on four minutes when ben Barba found himself some space and flung out a pass to Ryan Morgan who had a clear run to the line to score. Danny Richardson was unable to add the extras from wide. On ten it was a delightful try from Nathan Percival as he collected his own kick and went over to score. This time Richardson added the conversion for 10-0. On twenty-three the Vikings opened their account when Wellington Albert took a crash ball to go ten metres and stretch out an arm to score. Tom Gilmore was able to add the extras to reduce the arrears to four points. A Richardson grubber on twenty-seven was grounded brilliantly by Percival before he slid dead in goal as the Widnes defenders were observers. Richardson added the extras from wide for a 16-6 lead. It was a better showing by Widnes for the remainder of the half but neither side could add to their totals. A minute into the second half and Luke Douglas was sin-binned for a so called ‘crusher tackle’ but it did little to dampen the Saints spirit and two minutes later Ben Barba took a short pass and jink past four Widnes tacklers to score. Richardson failed to add the extras as the video replays suggested that Barba lostthe ball in the act of scoring. On forty-seven Tommy Makinson went over by the right corner flag for Saints fifth of the afternoon to further extend the lead for the twelve men. Richardson was unable to add the two but it was a massive ask for the Vikings to get back into the game. A Danny Walker 40-20 on fifty-four gave Widnes a great opportunity but they couldn’t capitalise and four minutes later Makinson put the result beyond doubt when he flew in by the corner flag for a second time on the afternoon. Once again Richardson failed with the boot, but the Saints 28-6 were ahead and the game was over. This was a comfortable victory for Saints, the second of a successful Easter weekend which sees them maintain their four point lead at the top of the table. Barba, Percival, Makinson and Richardson controlled the game from the outset and there was never any doubt about who would take the spoils. Widnes could drop into the bottom four if Huddersfield get the win against a woeful Catalans Dragons in the south of France in the late kick off. Vikings: Craven, Marsh, Chamberlain, Runciman, Ince, Heremaia, Gilmore (G), Gerrard, Johnstone, Chapelhow. Olbison, Wildie, Walker. Subs: Burke, Leuluai, Walker, Albert (T). Saints: Barba (T), Makinson (2T), Morgan (T), Percival (2T), Grace, Fages, Richardson (2G), Amor, Roby, Thompson, Taia, Peyroux, Wilkin. Subs: Smith, McCarthy-Scarsbrook, Douglas (SB on 41), Knowles.